Nazeebo is one of several Specialists in Heroes of the Storm. He was the first Hero I ever bought and leveled to 10, so I've a fair bit of experience with him (I'm level 70 now). 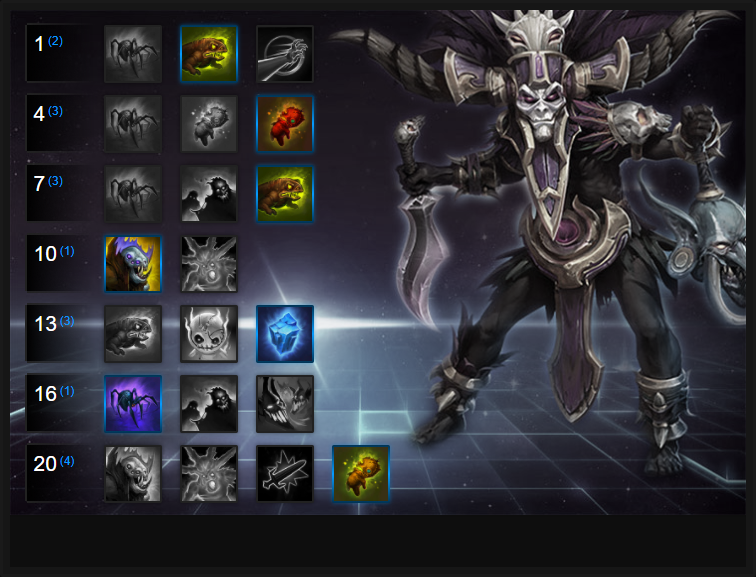 He has lots of control, can pressure a lane and can comfortably harrass many enemy Heroes. What makes Nazeebo so effective in Hero League is the fact the against uncoordinated teams, his abilities are ideal. His Corpse Spiders can comfortably zone and chase while dealing tons of damage, Zombie Wall is great for blocking or trapping enemies and Plague of Toads are capable of dealing good damage over time. I will add that unlike other Specialists, Nazeebo can be tricky to play. He needs to land his Zombie Wall, poke when he can and work hard to win a lane. Despite that, he's excellent in the current meta and his Corpse Spiders can carry pretty hard the moment you get to level 16. Voodoo Ritual (Trait) - allows you to poison non-Heroic enemies with all of your abilities and basic attacks and adds an extra layer of damage that can quickly add up over time. The second part of Voodoo Ritual means that as long as you remain safe, you can sustain yourself in lane almost indefinitely, as long as you're not over-using your abilities. The health and mana return of the trait isn't enormous, but combined with health globes and fountain allows you to muscle in on lanes fairly easily. Be aware that to maximize your intake of the trait and its health and mana benefits, you should ensure you land at least one basic attack or ability on minion waves. This typically ensures you receive the highest amount of return. Corpse Spiders (Q) - When thrown, Corpse Spiders will attack nearby enemies, prioritizing nearby Heroes. With no health bar, they won't block any damage for you. However, this also means they can't be damaged or moved by your enemies, making them extremely annoying to deal with in the right circumstances, including disrupting channels. The range on Corpse Spiders is reasonably far, meaning they're great for early lane poke. It's also worth noting that the impact of Corpse Spiders - throwing the vase holding them - deals solid damage. Always try to aim at a player, rather than near them as if the jar doesn't impact upon an enemy, no spiders will appear. Zombie Wall (W) - The only real form of crowd-control Nazeebo has, Zombie Wall has a variety of uses. It will deal some damage, but its real value comes from the ability to trap enemies, or cut off chokepoints. Once an enemy is trapped, it allows you and your allies to easily land skillshots, giving you somewhat high kill potential. It's important to note that you can press W to de-activate the wall if you accidentally stuck an ally inside. A good tip is to also use the Zombie Wall against an enemy tower to prevent enemy Heroes going back inside or to allow your zombies to damage the damage from the cannon shots. Plague of Toads (E) - With their area of effect damage, Plague of Toads are arguably Nazeebo’s main form of wave clear and burst damage. Considering their damage is dealt over time, there's no benefit to firing them at close range or from afar. What's important to remember about Plague Toads is not only their DOT component but the fact they have two charges. Effectively, you can cast Plague Toads back to back for a total of 6 Toads. What's particularly useful for this is not having double the potential damage available, but it allows you to pressure lanes quickly in order to trigger your Trait. Just be sure to have both charges ready during a team fight so you can drop them both quickly if you trap an enemy in your Zombie Wall. Gargantuan (R) - Once summoned, you do not have control over where your Gargantuan goes and he acts as an area denial tool rooted in a small radius. This beast does hit quite hard, and has a low cooldown Slam that, upon activation, will deal AoE damage and slow enemies. The fact Gargantuan is tethered to a small area is both a positive and negative. On one hand, it's great on maps that require an objective to defend. On the other, he's absolutely useless if the fight moves an inch too far away from him - he simply cannot follow. Either way, when used to deny an area he can deal high damage and allow you to solo a Keep relatively easily. Ravenous Spirit (R) - If left unchecked for the full duration, Ravenous Spirit can do huge amounts of damage. However, you cannot move while channeling this ability, which means you’re leaving yourself vulnerable if you don’t find the perfect spot to channel. If you are interrupted, the Spirit will dissipate. If you choose to go for this Heroic, it may be worth taking the Annihilating Spirit talent, as it increases both the cast range and movement speed of the Spirit. Primarily Ravenous Spirit is used for taking down forts and keeps or for attacking enemy Heroes when you've a composition that can easily protect you. Plague Toads now spawn only three by default and while they have 3 charges, it's relatively easy to miss targets if casting from afar. Despite that, as a quest Pandemic is incredibly easy to maximize, requiring only 40 hits against enemy players. Once achieved, you'll launch 5 Toads instead of 3, effectively allowing for 10 over 2 charges. Variable: One of the easiest quest talents in the game to complete, Widowmakers allows you to increase the damage of your Corpse Spiders by 30% after hitting just 100 Heroes. It literally takes a few minutes of poking the enemy or rotating lanes to have it finished. The damage boost is considerable. Blood Ritual allows Nazeebo to sustain himself almost indefintely in lane. By landing a killing blow against an enemy Nazeebo gains 2% of his maximum health and mana. Fundamentally, it ensures he never has to return back to his Core in order to replenish his health. Variable: If you're seeking raw health and mana, take Big Voodoo. Increasing the bonuses of your Trait by 100% is significant when you reach a high amount of stacks. Toads of Hugeness allows your Plague of Toads to increase in size and damage each hop they make. If they go their maximum distance, they'll each deal 15% extra damage up to a maximum of 60%. It's an enormous boost to your damage over time and considering it works across both charges, is a huge amount of AOE pressure - especially if you've completed your Pandemic quest. Variable: Still sticking with the power of Corpse Spiders, Spirit of Arachyr allows Nazeebo to spawn 2 more spiders if you only hit one target. This might sound difficult to do, but it's surprisingly easy even against a group of heroes of minions. Simply aim your reticle on the edge of the player and sure enough you'll now have 5 spiders every time (a HUGE damage boost). If you can catch someone in your Zombie Wall, you can quickly drop Gargantuan on their head followed by Corpse Spiders. It's a huge amount of burst and even though Gargantuan can't follow once they've broken free you'll have caused enough damage that they won't be able to return to the fight any time soon. Gargantuan also has a short cooldown and allows you to comfortably solo any camp or boss. Variable: Ravenous Spirit is an amazing Heroic ability in any team fight as it allows you to channel the spirit far away from your body. It's fantastic at pressuring one player and forcing them away from a team fight. It also works great at popping Zeratul or Nova out of cloak. If you can cast it when the enemy team are grouped together, you'll often wipe them simply because the damage is so fast and so high, with the Ravenous Spirit able to cleave through enemies. Ice Block is great against just about everyone. You can mitigate all damage, survive ganks or use it to buy time. It's a one-catch all solution to any enemy you're facing and less restrictive than the variables below. Variable: Thanks to Guarian Toads, every time you hit an enemy with Plague of Toads you gain Resistance, reducing all incoming damage by 25% for 2 seconds. Across two charges, that's a duration of 4 seconds. It's a huge amount of mitigation and allows Nazeebo to withstand much more punishment. If you've also maximized your Trait, you'll rarely have your health cut down. Spider Colony allows Nazeebo to lower the cooldown of Wall of Zombies and Plague of Toads by 0.25 seconds every time they attack. It's a solid Talent for maintaining your Toads of Hugeness uptime. Vile Infection is a talent you'll rarely get to (matches are simply too short) but if you do, it's an enormous boost to your damage output (your Trait now affects Heros and its damage increased by 150%). The only catch is the fact you'll need to have gotten your Trait to 175 to benefit from it - more than possible by level 20 if you rotate lanes constantly. Below is a table of matchups with Heroes Nazeebo can comfortably (or uncomfortably) encounter that he is capable of killing, with some more difficult than others. Those not listed should be avoided 1 on 1. Genji: His mobility, poke and Heroics make him a nightmare for Nazeebo to deal with. Very hard to land your abilities against. Jaina: A very tough fight but the key is to trap her in your Zombie Wall she'll take a huge chunk of damage. Keep her at range as much as possible and duke her skill shots. Kael'Thas: Similar to Jaina, you have to duke his main skill shots. If you do, you can easily decrease his health as you poke with Corpse Spiders. Kerrigan: Her pull is the only thing you should worry about. Avoid that, bait her and trap her in Zombie Wall once she's attempted to leap at you. Gul'dan: His sustain combined with Fel Flame can quickly clear your zombie wall. He'll also be able to keep his mana topped up while draining health from you or your zombies. Sonya: A tough fight because her spin-to-win can tunnel you very easily. Also her spear makes evading her even harder. If you get a Zombie Wall she can also Leap out of it. Keep your distance and poke as much as possible. Thrall: If he roots you, you're in serious trouble. If needs be, he can also follow up with Sundering and Chain Lightning to finish you quickly. Tracer: You literally can't do anything against her. She'll run rings around you, can Blink out of Zombie wall and avoid everything you throw at her. This section of our guide contains a list of tips and tricks we think will help your Nazeebo play. We'll continue to add to the list as required and if you have any tips you'd like to share, let us know in the comments below and we'll place them here. 1. Remember that Zombie Wall is also useful as a barricade to prevent players running away or from chasing you - even if you haven't trapped them inside it. 2. Your Gargantuan by default lasts a long time so try to use it as much as possible should you take it. 3. Your Plague of Toads are slow. You should try to use it in close proximity for maximum splash, preferrably when someone is trapped inside your Zombie Wall. 4. Remember that your basic abilities poison non-Heroic enemies. Pressure them with this in lane to maximize your Trait. 5. Corpse Spiders later game do a lot of damage and are cheap on mana. Don't worry about using them often if you've obtained a large mana pool from farming lanes, thanks to your Trait. 6. Positioning is incredibly important for Nazeebo. Try to always have a clear route of escape and use your Zombie Wall as a barrier behind you. 7. You can use Zombie Walls on enemy structures and they'll attack it. Use this to distract towers while you attack them. 8. Pressing Alt + W will place a Zombie Wall instantly at your position. Use this and then walk forwards to trap a melee Hero next to you. 9. Always try to cast your Plague Toads at maximum range when they've received your level 13 talent. You need them to do maximum damage against structures and objectives by increasing their number of hops. 10. If you have someone trapped in a Zombie Wall, hit them with your Corpse Spiders followed quickly by Plague of Toads. It'll deal huge damage. 11. When using Ravenous Spirit, try to hide in a bush or out of line of sight. Use the vision your team is giving you to cast it and send it into combat. 12. Your Zombie Wall will also act as a distraction against minion camps. Be aware however they'll they don't last long enough to kill a camp but will do most of the work. 13. Try to always summon 5 Corpse Spiders by hitting only a single target. It massively increases your damage and can pressure any team. Thanks for reading our Nazeebo guide! You can now help support Ten Ton Hammer, so we can keep writing guides like this.